A road trip on the Southern Scenic Route from Queenstown to Christchurch on the South Island of New Zealand. Michael Milne is a nomadic travel writer who's been wandering the globe for two years. The drive to Milford Sound. The south tip of New Zealand. 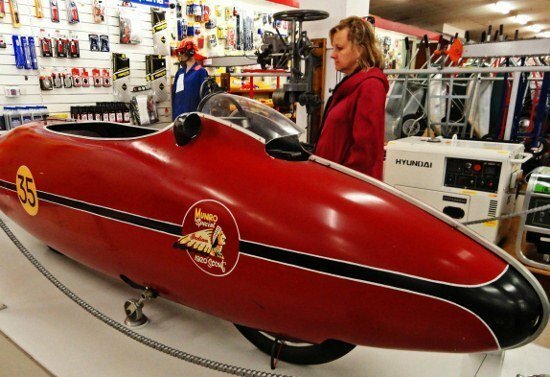 World's fastest Indian motorcycle in Invercargill. 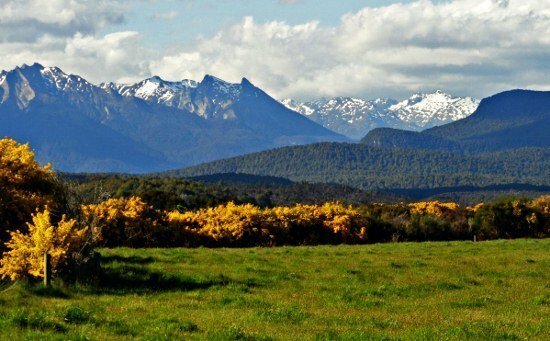 There’s a reason Peter Jackson selected the South Island of New Zealand to film his epic Lord of the Rings trilogy. The landscape with its snow-capped mountains, glaciers, rainforests and sweeping vistas lives up to the dreamland created by author J.R.R. Tolkien. The countryside is so jaw-dropping that the tourism board created an official Southern Scenic Route (SSR). The road lopes along for almost 500 miles, beginning in Queenstown then skirting the southern half of the island before ending in Christchurch. Our New Zealand road trip began after a flight into Queenstown. The South Island was a culture shock after two weeks in the urban setting of Auckland. From the air we saw snow-capped rocky peaks, known as the Southern Alps, spreading to the horizon, punctuated by the occasional lake of vivid turquoise and a fleeting glimpse of the Franz Joseph glacier. As the plane descended, alpine meadows blanketed with yellow wildflowers appeared. We half expected to see Julie Andrews twirling around singing The Sound of Music. The route to Milford is one of the world’s great driving destinations. The steep and winding road passes through a remarkable series of microclimates, including farmland, alpine meadow, dense forest, desert, rainforest, snow-capped mountain ranges and waterfalls. It’s a journey best taken in summer as the winter brings a severe avalanche risk. After barreling through the one-lane Homer Tunnel, the descent back to sea level is negotiated through a series of hairpin turns slickened by mist spraying off nearby waterfalls. Although it was summer, snow drifts still caressed the side of the road. 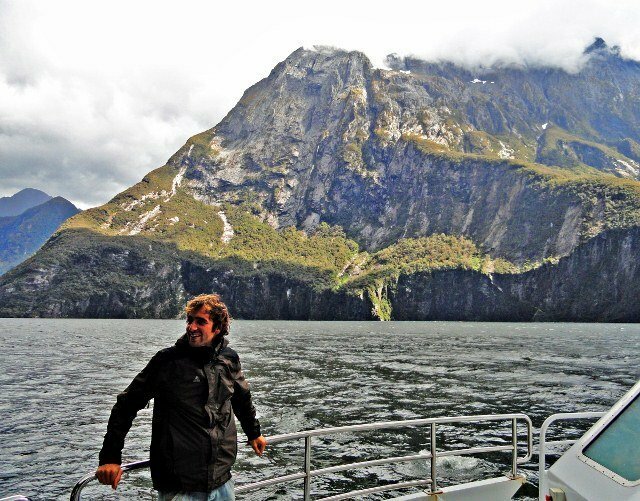 The popular boat ride on Milford Sound requires some strategic planning. Four tour companies operate from the single pier; boats chock full of day-trippers depart about every 15 minutes for the 90-minute ride through the narrow fiord. However, by afternoon the crowds have departed, the boats are almost empty and fares are lower. Just after we boarded, the overcast sky let loose a gentle rain that eventually turned into a downpour. After getting drenched we headed indoors but much of the scenery was no longer visible through the foggy windows. From the fiordlands and mountains the SSR heads due south, passing the almost tropical looking beach at Florence Hill. Along the coast the trees are angled sharply away from the water, their roots struggling to retain a firm footing against the unrelenting onslaught of the gusts whipping off the ocean. The city of Invercargill is home to possibly the world’s quirkiest hardware store, or perhaps the world’s quirkiest auto museum. At Hayes Hardware, vintage cars (including a few mint Thunderbirds) and motorcycles nestle among the aisles of generators, hammers and paint. The big draw at Hayes is the customized 1920 Indian Scout motorcycle raced by local Burt Munro to set several world speed records at Utah’s Bonneville Salt Flats in the 1960s. It was the subject of the film The World’s Fastest Indian, starring Anthony Hopkins. Maybe it’s because New Zealand is so remote, but they really like planting those multi-directional signposts that indicate the distance to faraway destinations. On the SSR one is placed just beyond Invercargill, in the small town of Bluff, to mark the southernmost point on the South Island. The marker displays the mileage counts to places like Sydney, London and even the South Pole. Despite feeling like we’re almost at the bottom of the world, the southern tip of New Zealand is only about halfway between the equator and Antarctica. The northeasterly portion of the SSR winds through hilly pastureland with occasional glimpses of the bluffs over the ocean. Hillsides and meadows are covered by so many grazing sheep it appears that a giant dandelion sprayed its wispy white tendrils everywhere. The pace is leisurely; sheep-related traffic jams are common as farmers herd their flocks down the main road. Dunedin on the southeast coast is a university town, reflected in its superb used bookstores and cafes. The flamboyant Edwardian-era railway station, where no surface is left undecorated, is also the home of the nation’s sports hall-of-fame. Railroad buffs can admire the architecture and trains while sports fans reminisce about Olympic athletes and the All-Blacks, New Zealand’s 2011 world champion rugby team. True devotees can push a button on a wooden box near the entrance which emits the aromas of a rugby match. For those who prefer to sniff something sweeter, Cadbury’s offers tours of its chocolate factory a few blocks away. Driving northward the SSR hugs the coast before gradually climbing back into the mountains. There are many interesting side trips: we followed a small sign leading us to a remote ocean bluff where a family of seals frolicked on the nearby rocks. The hills and roadsides are covered with a kaleidoscope of colors from wild lupine that sprouts with abandon. The bottle-brush shaped flowers grow in a dazzling array of purples, pinks, yellows and whites. The lupine and bright mustard-colored gorse bushes combine to put on a daytime fireworks display. The sleepy town of Twizel serves as a prime base for viewing Aoraki Mount Cook, New Zealand’s highest peak. Soaring over 12,000 feet, it was the “training ground” for Edmund Hillary as he prepped for his legendary conquest of Mount Everest. The greatest Kiwi ever is showcased in the Sir Edmund Hillary Alpine Centre, a free museum located in the Hermitage Hotel in Mount Cook Village. 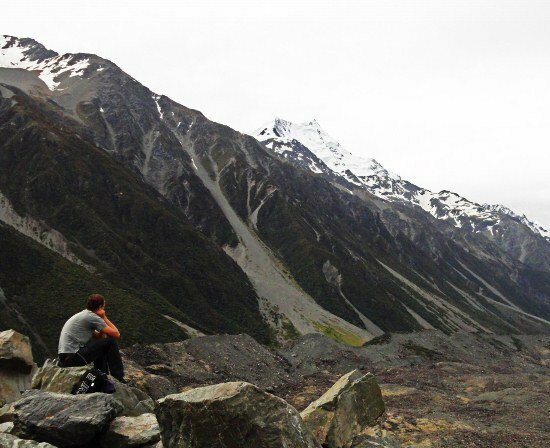 The nearby Tasman Glacier is accessible via a steep 20-minute hike up a rock-strewn path. We sweated and grunted our way to the top to look out over…not much. There was a beautiful blue river with a few ice floes, but the glacier itself looked like the contents of a gravel quarry. A nearby sign echoed our thoughts as it stated, “Where’s the glacier?” The sign explained that glaciers are covered with rocky stubble called “surface moraine.” The ice, which we expected to see, hides beneath it. Massive sights such as glaciers are best viewed from the air. So we went for a barnstorming ride in an open-cockpit biplane, outfitted in leather flight jackets and goggles for the full Snoopy fighting the Red Baron effect. Pilot Chris flew by the Ben Ohau mountains and nearby glacier before swooping low over the meadow used by Peter Jackson to film the Pelennor Fields battle scene in The Return of the King. Flying out of Christchurch a few days later we were rewarded with a last glimpse of the vistas we had seen from the ground. Our road trip revealed that there was even more than the “greatest hits” of mountains and glaciers and fiords. Seeing the South Island at our own pace enabled us to experience not just the majesty of the Lord of the Rings scenery, but also the natural beauty that exists around every bend in the road. 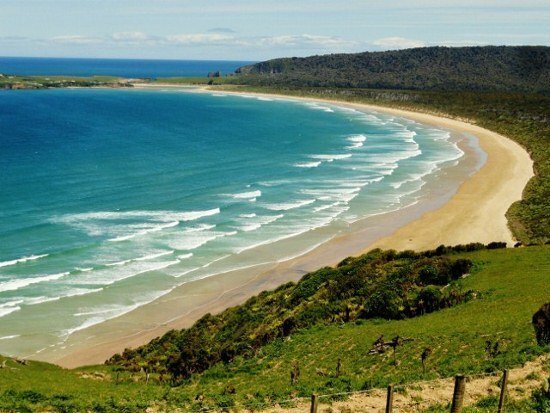 New Zealand is a perfect destination for an independent road trip. For more about our travel in New Zealand go to the Changes In Longitude travel blog.